Suakoko, Bong County: The Cuttington University in Suakoko, Bong County has conferred an Honorary Doctorate Degree on President George Manneh Weah. The Doctorate Degree of Humane Letter (L.H.D) – Honoris Causa – is in recognition of President Weah’s accomplishments in many fields including humanity, football, peace-building and education. The honor was bestowed on the Liberian leader during the 57th Commencement Convocation of the University on Friday, June 29, 2018 in Suakoko, Bong County. In the citation; Cuttington University determined the many strives and impacts President Weah has made over the years on the world stage, as the only African to reach the acme of football, winning European and FIFA best player of the year, as well as the endeavors he made to bring peace to Liberia through sports. The University stated as reasons for awarding the Liberian leader his “par excellence” activism and humanitarian role over the years. “During your football career, you stood off the pitch to denounce racism in football, and you became a UNICEF Goodwill Ambassador. You used football to bring hope and joy to the children of Liberia and Africa in general,” the University recalled. The University also recalled President Weah’s role as peace ambassador during the administration of former President Ellen Johnson Sirleaf in 2013: promote national reconciliation and peace-building, impacted and informed the decision to confer the doctorate Degree on him. ‘Your timely intervention in the recent impasse at Cuttington University has proven again that you are indeed a problem-solver, and an expert in conflict resolution. You have committed and continues to commit your personal resources and finances in peace-building initiatives,” the University recounted in the citation read by Prof. Anthony Siakor, Acting Vice President for Academic Affairs. 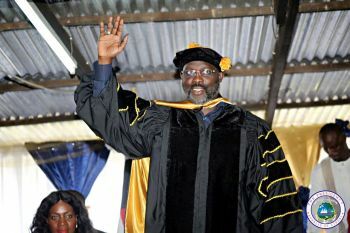 President Weah served as the Commencement Speaker for the 57th Commencement Convocation during which over three hundred students received degrees in various fields of studies.